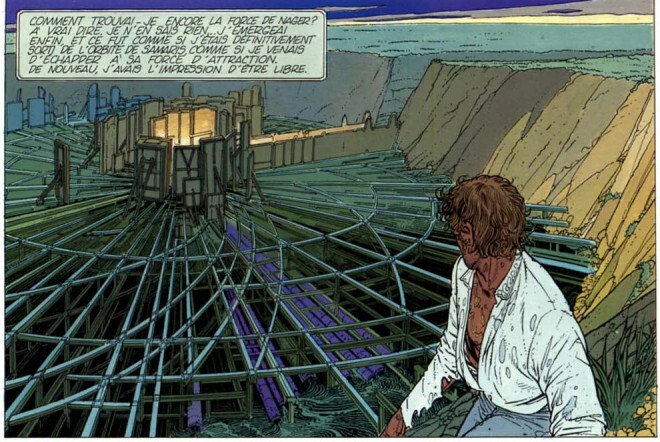 We’ve previously examined the story of The Walls of Samaris, a French masterpiece that deserves to be known among comics-literate Americans. In part two, we looked at several implications of its trompe-d’oeil device. If you haven’t read those, start there, because there’s a lot of fascinating, complex material here, and you really deserve to have it unfold in a logical fashion. Don’t say I didn’t warn you. There’s also my introduction to the overall series of The Obscure Cities, though you don’t have to read it to understand these three articles on The Walls of Samaris. That’s not to say that The Walls of Samaris fulfills all of its ambitions. While its ambiguity is often successful, it leaves too many questions unanswered. None of this is very clear, but we can guess that it’s true, since Franz rejects it as “gibberish” — and he’s usually wrong, such as when he says (a few pages later, when he escapes from Samaris) that he feels free. How exactly the city consumes the images or forms of travelers isn’t clear, but we can guess what it feels like: it’s probably the lethargy that Franz feels, as he feels weaker and weaker, spurring him to try to leave. It is fairly clear that Samaris doesn’t consume people and replace them. The book says that the city “will seize,” not replicate, the images of those she captures” and “will make them her images,” suggesting control, not replacement. So too does Franz’s understanding of the book: he says Samaris “captur[es] the forms” of travelers, not replaces them. Similarly, although Franz sees the equipment at the heart of Samaris, he doesn’t see anything to manufacture androids or otherwise replace people. It seems more likely that Samaris transforms people. Keep in mind that there are two types of human simulacra in the story. 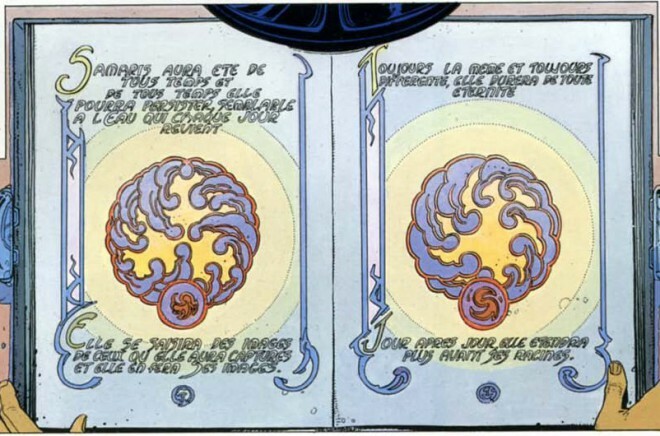 One is the two-dimensional kind, which Franz sees briefly in Samaris and again in the council building of Xhystos. The other is a three-dimensional simulacrum, represented by the people Franz sees apparently sleeping in crates. It’s clear to Franz that they’re not real humans, that they’re mock-ups or dummies of some sort. But there’s no sign that they replaced the humans they resemble. Rather, it seems that they are those humans, somehow transformed. That they’re sleeping is supported by the fatigue that Franz feels, which suggests that the city not only exerts some control over them but may be feeding off their energy. This process might even result in the person becoming, ultimately, two-dimensional. What the city does to its visitors is related to whether Clara is a simulacrum. Unless the city has somehow created her from Franz’s memories, which we see no evidence of, we may assume that she’s the same Clara who’s Anna’s younger sister and who left Xhystos with Mark, prior to Franz’s departure. Franz only thinks he sees her in a crate, but only the top of her head is shown. Still, it’s pretty obviously her — and Franz probably knows it, given that he leaves the city without mentioning her again, despite being earlier so intent on taking her with him. We may also recall that she departs each day at the same time, presumably to go to her crate and rest (and perhaps thus feed the city). That’s she’s a simulacrum is also supported by the three strange panels in which Franz assaults her, after which he abandons his idea of taking her with him. When she speaks there, it’s without word balloons, and the lettering has a wavy outside border. These both suggest emotion, but they may equally suggest something mechanical. Accenting this, she looks particularly white in these panels. Perhaps that portion of herself that the city controls is speaking there. Whether or not this is true, Franz certainly recognizes the strangeness of this scene, because it’s after this that he decides to stay awake and solve the city’s mystery. So how much control does the city have over her? She probably retains some independence, because she urges Franz (a potential food source for the city) to leave “before it’s too late.” Yet it’s clearly too late for her, since she says leaving with him would be “impossible.” She knows enough of the city’s effect to understand this, yet there’s no reason to believe that she remembers Xhystos, despite her claim to the contrary. This at least gives us some indication of the extent to which the city controls its human food. The effect Samaris has on visitors is also related to the question of why many years seem to pass between Franz’s departure from Xhystos and his return. Whether this is in fact the case or not may seem questionable. After all, since Xhystos is a simulacrum, it may at first seem that everything there is questionable. Is it possible that Franz has gone to the wrong address for Anna’s apartment or the Stork Club? The fact that the council seems to remember Franz’s mission, yet says it was “very old, before the Khar War,” is harder to reconcile. 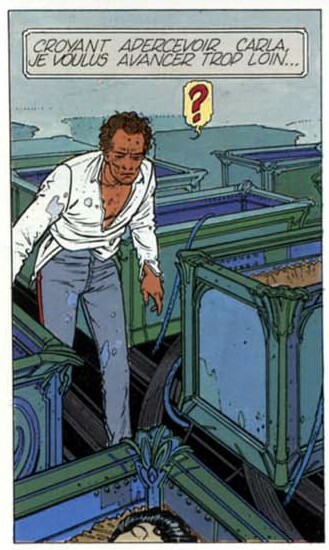 But the ultimate proof, like the ultimate proof for the idea that Xhystos has always been a simulacrum, comes from a single panel: the decaying elevated roads Franz sees, on his way back to Xhystos. They’re partially seen one panel earlier, though not commented upon. Here, however, Franz narrates that these roads look “abandoned long ago.” Yet they weren’t shown on his considerably more detailed trip to Samaris, despite that they would have been relevant. In a lesser comic book, this might simply be an error, but not here. Given the later indications of the passage of time, this panel clinches matters decisively. This passage of time may also explain how Anna’s dress rips so easily. Even if we take her to be a mannequin of some sort, there’s no reason why clothing on a mannequin should be weaker than normal fabric. It’s possible that the fabric of her dress has simply aged, even if she hasn’t. So how do we explain this passage of time? It must be part of the Samaris effect. Given this, a fuller picture of how Samaris works on its visitors becomes clear. The city drains the energy of its visitors, which accounts for why Franz feels fatigued shortly before his departure. This draining effect also accounts for why Clara leaves about the same time each day, apparently going to sleep in one of the crates. In the process, those people are somehow physically changed, becoming more like automatons, although they retain some independence. These victims also become psychologically changed, as demonstrated by the fact that Clara cannot recall Samaris and Franz’s distorted sense of time. The fact Franz doesn’t remark sufficiently upon certain details may also indicate the city’s manipulation of him. For example, it’s not clear how repetitive his conversations have been with Clara until he confronts her about it. Equally, it’s odd that he doesn’t remark upon the fact that those decaying roads weren’t there on his first voyage. Essentially, we may have been reading the narration of someone whose ability to notice and mention things has already been diminished by the Samaris effect. This is true at least from the moment he arrives in Samaris, but it may have begun earlier, since his narration is in the past tense. If true, this may explain some of the ambiguity of the narrative. If Xhystos is, to a lesser extent, a simulacrum like Samaris, we should expect some of these effects there as well. And that’s exactly what we see. Franz feels weaker and weaker in Xhystos, despite having just completed the arduous journey back, suggesting that Xhystos can be equally draining. As mentioned before, Peeters describes Xhystos as ”calm and a little fatigued.” As Franz leaves the council, one of its members says, “Again one of these sick people! …There are more and more of them.” This suggests that not only fatigue but displacement or forgetfulness are occurring in Xhystos too, and it’s worth mentioning that those in Xhystos may treat the disoriented and wandering Franz with disdain or confusion, but they don’t treat him as unique. Becoming captured by Samaris does have one benefit, however: the city’s victims don’t seem to age. One could argue that Franz looks a bit older at the end than in the beginning, but he’s also haggard from his journey, so it’s hard to tell. But Clara doesn’t age. After seeing her for the last time, Franz does lay unconscious for an unspecified length of time after falling into the center of Samaris, but his beard hasn’t grown significantly when he awakes. Thus, it seems that Samaris preserves its victims, keeping them alive in order to drain them for a longer period. This means that not only is Xhystos a simulacrum, but Franz as well. He doesn’t escape Samaris; the city has been successfully feeding on him for years, altering his memory of the passage of time. Everything he’s experienced in Samaris is even more of an illusion than he discovers. Again and again, these discoveries uncover added meaning to earlier scenes. Here, we may think of both Franz’s friends, who call his acceptance of the mission madness, and Anna, who’s certain that Franz won’t return. Only now can we realize how they were right. That the main character turns out to be a simulacrum without knowing it — and without being stated explicitly by the text — further ties The Walls of Samaris to Blade Runner, mentioned earlier for using the idea of people who are simulacra to address similar social themes. Only Franz, in his typical way, seems to know that he’s a simulacrum without saying it. First, he at least intuits how the city drains people, because his response to assaulting Clara is simply to stay up all night. He doesn’t follow her to see where she goes, nor go out and investigate the city by night. He’s apparently never had insomnia before and currently feels drained during the day, a sign that the city is feeding on him, much like it’s feeding on Clara, who must leave to go sleep in her crate. Obviously, staying up all night isn’t a rational way to solve the mystery — unless Franz knows, at least subconsciously, that he’s already a victim. Second, Franz never explains why he leaves Xhystos to return to Samaris. We assume it’s because, having discovered that Xhystos is a fraud like Samaris, he has no home there and prefers Samaris and Anna to a city in which he now feels like a foreigner. But his phrasing is odd. Still in the council, he narrates, “To rejoin these silhouettes without life, I had abandoned those truly close to me.” The French used here for “those truly close to me” is mes veritables proches. The noun proches literally means “those near to me,” proche also serving as an adjective to mean “close.” But proches can also be translated as “family.” Obviously, Franz has no literal family in Samaris — unless he has recognized that he has been altered by Samaris and belongs there, with others who have as well. Similarly, in the book’s final panel, Franz calls Samaris “my city, one I never had to leave.” We may assume that Franz “never had to leave” because Xhystos isn’t threatened as is, in fact, as fake as Samaris. Given this, he seems to prefer Samaris (and Anna) enough to call it “my city.” But if we understand Franz as a product of Samaris, as already a simulacrum, it becomes his city in a more meaningful way. 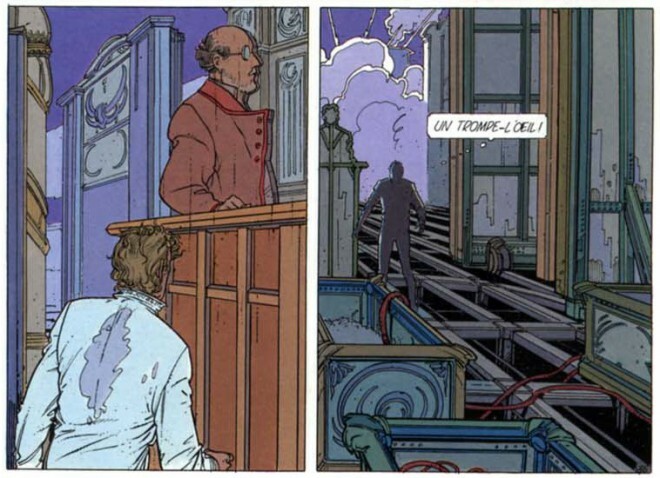 Franz is even depicted as a silhouette in the final panel, a subtle visual suggestion that he is in some way a simulacrum, that he’s already fallen prey to Samaris. This doesn’t mean that Franz knows any of this consciously. There’s little to indicate that he does. But he often says things that hold truths of which he’s not aware, and his inability to recognize things consciously may even be a product of Samaris having altered his mind. Other unanswered questions have somewhat less definitive answers. For example, while we can piece together a good deal about how Samaris consumes visitors, it’s not clear what mechanism it uses to do so. It’s truly strange that we should see the inner workings of the city, which are all vaguely scientific, right down to the hydraulic mechanism that moves the city’s façades, yet not see any device that we could imagine capable of draining people’s energy or dimming their ability to remember (or to notice things, if we believe that’s the case with Franz). Later volumes in the series do involve fantastic, often unexplained elements. What’s interesting in these volumes isn’t the cause of these elements but their effects. So it’s not hard to believe that The Walls of Samaris simply isn’t interested in how the city consumes its visitors. My favorite explanation is that Samaris has no specific, or at least separate, mechanism for doing this, and it’s an effect of the trompe-d’oeil itself. The façades themselves have this power. After all, staring at optical illusions all day may be mentally fatiguing over time, and they depend on the viewer’s inability to notice minor incongruities. It’s a short jump from this to imagine that the façades somehow have the mysterious power to extend these effects, as well as to feed on the viewer’s mental energy. This would explain how characters like Franz and Anna are able to act independently, while also losing their memories. While examining the sleeping human simulacra, Franz asks where the city’s builders are — a question that’s never answered. There’s no hint of an answer, outside of the existence of that book, in the city’s underground center, that uses the sundew pattern. But given that there’s no sign of the city’s builders, it seems fully capable of functioning on its own, and the book Franz finds implies this by talking about what the city will do, without mentioning anyone to govern or maintain it. Just how far this goes is open for some debate. For example, is the city capable of repairing, on its own, the damage Franz caused? There’s certainly evidence that the city is in some way sentient, or at least able to make decisions on its own. For example, it stops its whooshing noise when Franz inquires about it. It also begins to move its interior walls around, after Franz damages it, as if trying to squash him, and it even seems to throw up obstacles to block his way. It may even have shaken him off the tops of those façades deliberately. In fact, that book Franz finds implies that the city might even be organic, after a fashion. Its description of the city is extends the plant metaphor so far as to imply this. Franz dismisses the book as “uselessly encumbered by metaphors,” but he’s wrong in rejecting it, so he might be wrong about any of the plant-like language being a metaphor at all. The book even says that the city was “born like the plant,” which suggests that it was grown, not created. True, it’s common to describe inanimate objects, especially ones like cities that are likely to be personified, as having been “born.” But it’s odd to combine this with the language of a plant, rather than a person. It’s quite possible that someone created the city, which would account for the book at its core, while the city itself expanded into its present shape. Then there’s the matter, referenced in the book Franz finds, of how “the city will expand like the plant.” It claims that, “Day after day, she will extend her roots further.” This probably only refers to the city growing organically, but it may also hint at the connection between Xhystos and Samaris. We’ve already dealt with how long Xhystos has been a simulacrum like Samaris, but it’s worth asking which of the two cities was a simulacrum first and what their relationship could be. Perhaps Samaris has in some way infected Xhystos, in a manner parallel to a plant reproducing itself by sending out seeds. That’s hinted at when Franz makes the long journey back to Xhystos, narrating that he’s driven forward by the thought that “Xhystos must be saved.” How does he think Samaris threatens Xhystos? Losing additional travelers to Samaris, while perhaps sad, isn’t a threat Xhystos. Maybe Franz is using hyperbole here, despite his dismissal of the book he found. Supporting this, the governor of Samaris says that the sundew “used to flourish in this region,” which might be an allusion to Xhystos. It certainly suggests that the creator(s) of Samaris came from elsewhere in the region. And Samaris was clearly created, not grown through some organic process, given the book lingering on an altar in its underground heart. Samaris also represents an ambitious building project, even if the city is capable of growing organically. Given these facts, a theory begins to emerge. Xhystos was, as Franz’s narration on the final page suggests, “the simulacrum of simulacra.” It at least had a council that was false, even if the entire city wasn’t. And these automatons, or whomever was behind them, may have also reconstructed the city, perhaps incorporating some façades like those later seen at Samaris. It’s even possible that the architect who did this reconstruction was himself responsible for this entire situation, including the phony council. In any case, this experience reconstructing an entire city might have turned out to only be a dry run. Reconstructing a populous city wouldn’t allow for the fullest incorporation of buildings that were, in fact, conglomerations of trompe-d’oeil. But this device, along with the possibility of building an entire city, suggested the possibility of building Samaris. Since the massive trompe-d’oeil that is Samaris seems to have some mystical or unexplained power, draining people of energy, that power was first discovered during the rebuilding of Xhystos. All of this suggested the possibility of building a new city from scratch, unencumbered by existing inhabitants, utilizing this principle of the trompe-d’oeil and the power it represented. We can even imagine how this might have happened: an architect or someone working on the reconstruction seized upon the sundew, which grew around Xhystos, recognized the parallel between the plant’s carnivorous ways and the trompe-d’oeil‘s draining power, and saw the potential for a new city organized on these principles. Thus was Samaris created. Its building represents such an effort that the city’s creation must have been orchestrated through the council of Xhystos, which could direct these resources, covertly or overtly. And it seems as if Samaris falls within the wider sphere of influence of Xhystos, which exercises control over its suburbs, who are shown to live in squalor compared to the rich, quasi-imperial city itself. 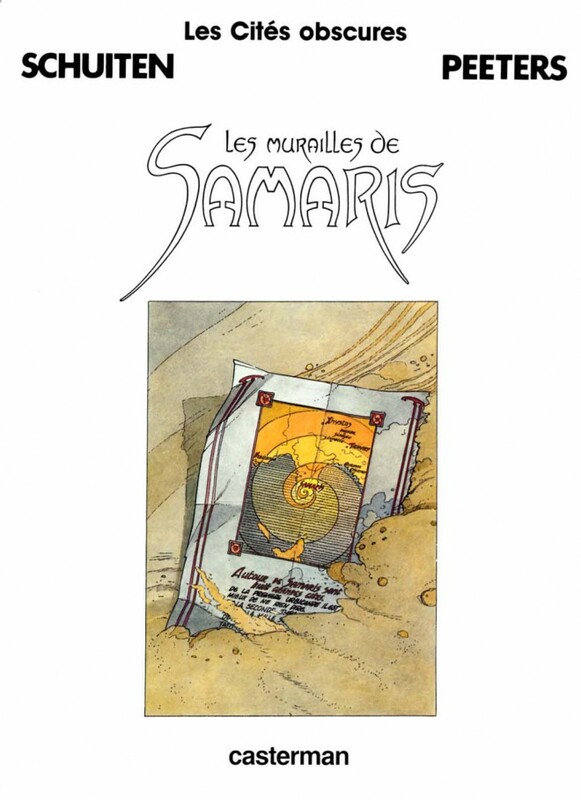 The main architect behind Samaris left behind that book, deep within the new city. 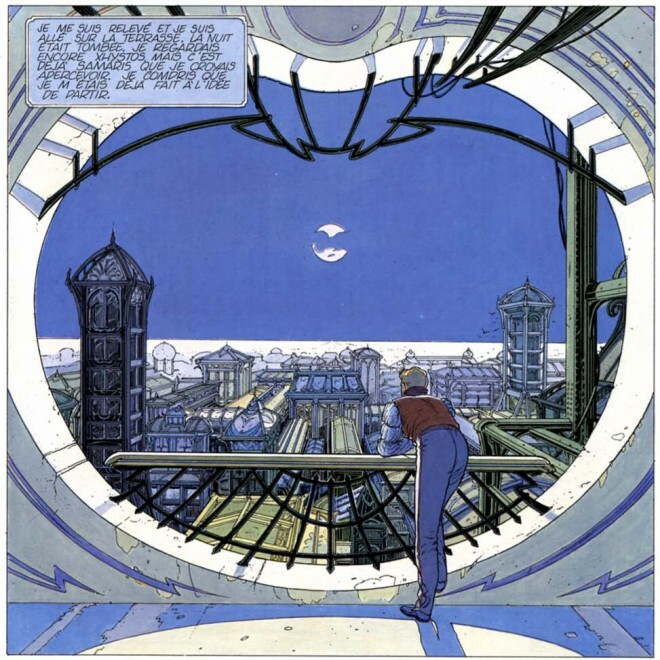 It’s worth noting, given Schuiten’s attention to architectural style, that the pages of the book itself uses the art nouveau style, reminiscent of art nouveau posters, with their stylized text and ornamentation. This implicates Xhystos rather decisively in Samaris’s creation. If we see the “S” which seems to form at the bottom of the book’s sundew pattern as representing Samaris, it even looks like it’s at the southern edge of the sundew, suggesting Samaris’s location, relative to Xhystos. This timeline suggests that Samaris is a rather new city. That’s supported by the fact that it seems like it has plenty of room in which to grow, as well as the fact that it seems sparsely populated. This theory of Samaris’s construction obviously adds menace to Xhystos, suggesting the city’s “machinations,” to which Anna alludes. It also highlights the idea of architecture and urban planning, both in the reconstruction of Xhystos and the construction of Samaris — an idea with ominous overtones and one that would become the subject of the next book in the series, The Fever of Urbanicande. In fact, the architect protagonist of that book, Eugen Robick, is the man whom Franz encounters, upon his return to Xhystos, living in Anna’s old apartment. Robick, who will redesign Urbanicande, is in Xhystos to investigate that city’s wholesale redesign. Of course, the redesign of Xhystos and the devotion of resources to construct Samaris have ignored the poverty of Xhystos’s suburbs. In fact, Guide to the Cities says that the Khar War, to which the council refers, was a war with these suburbs — a revolt, as it were, against the quasi-imperial capitol. This same intersection of grand architectural projects and social justice will become a major theme in The Fever of Urbanicande. So why does the council send Franz to Samaris, if it has actually constructed Samaris? As food. As food for the young and growing Samaris. It’s no different than an owner of a sundew, or any other carnivorous plant, sending someone into the greenhouse to investigate, knowing that they’re going to be eaten. And why not promise Franz “the order of the Grand Commander and perhaps even a seat on the council” upon his return? After all, he’s never going to come back, and he’ll never take a place on a council composed of automatons. Franz has been a pawn all along, precisely as Anna suspected. What’s perhaps most horrifying about this is that Franz is made to sign paperwork, to make everything official. To be sure, the clerk with the paperwork and the men who convince Franz to take the mission may not know that Franz is never supposed to return. But what a horrifying indictment of bureaucracy, to go through these official motions of the state, as part of sending someone to his death — or at least to being converted into a simulacrum, an amnesiac food source, over a prolonged duration. So what is the rumor, at Xhystos, about Samaris? Before answering that, I should first offer a confession: what I’ve translated as “rumor” is rumeur, which can mean “rumor” (especially in the context of news) but which can also mean “hum” or (in the context of people) “murmur.” So it’s a perfectly responsible translation that indicates the people of Xhystos are reacting to the sound of Samaris — the same sound Franz hears in the city itself. Of course, we should reject this reading, because it’s clearly impossible for the sounds of Samaris to be heard, so many miles away. During the long journey to Samaris, Franz’s narration makes no reference to approaching the source of any sound. And even if Samaris only makes sounds when someone new is visiting, for the sound Franz hears in the city to be audible all the way in Xhystos, it would have to be so loud in Samaris that Franz could hear nothing else, dialogue included. It’s possible that, although the sounds can’t be heard at distant Xhystos, planes flying near Samaris, like the ones seen in the book itself, might have heard these sounds. However, the lack of visitors returning to Xhystos from the direction of Samaris is also part of the narrative, which virtually prohibits any interpretation of rumeur as literally representing the sounds of Samaris. No, “rumors” is either what’s meant or the far more evocative, logical translation. But the double meaning of rumeur does foreshadow the sounds Franz hears in Samaris, implicitly connecting those sounds to the rumors about the city. So to return to the question, what are these rumors? It’s fairly clear they involve the disappearing travelers. Obviously, those heading to Samaris aren’t likely to return, given that city’s carnivorous nature. But Samaris is also a mysterious, largely unknown place to the inhabitants of Xhystos, and these rumors add to the story’s sense of mystery. So what about those other voyagers from Xhystos? Most, like Clara, probably became captured by Samaris. Others might have become lost during the journey, although the fact that they have sent no further word strongly suggests that they too have been captured by Samaris. These missing voyagers could be anyone we see in Samaris, and we wouldn’t know it. For all we know, the council’s representatives could have sent other people on missions similar to Franz’s. How many of the people sleeping in crates in Samaris, their energy sapped to power the growing city, were sent there from Xhystos to provide food to this infernal experiment in urban construction? What were the fates of Pierre and Mark, the other two travelers mentioned by Franz’s friends at the Stork Club? Their mention triggers three tall, narrow flashback panels, the first two of men and the third of Clara. We may assume that the two men are pictured in the order they’re mentioned in Franz’s narration, although they’re in profile and at a distance. 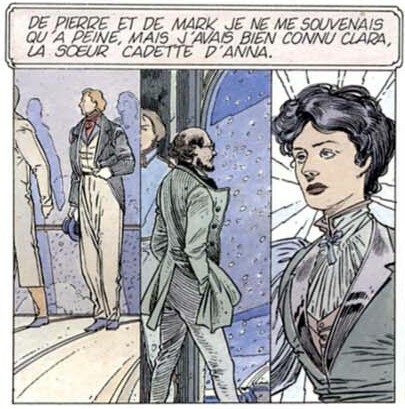 This reflects Franz’s own memory: he narrates that he “could barely remember Pierre and Mark” but recalls Clara strongly, so it’s appropriate that she’s pictured in close-up. Supporting the idea that the two men are pictured in the order Franz mentions them, Mark left with Clara, suggesting that they were a couple, and it’s logical that Franz, who remembers Clara, would remember Mark better than Pierre. Thus, Mark, while still in profile, depicted as nearer and thus a bit more fully than Pierre. So are Pierre and Mark also in Samaris? They could be anyone we see there, living lives like automatons — a potentially horrifying thought. But what about the fact that Mark left with Clara, suggesting that they were a couple? Once captured by Samaris, Clara has been made to forget Xhystos. There’s no sign of Mark, but there’s also no sign that Clara remembers Mark. Equally, we may guess that Mark, if he’s also somewhere in Samaris, doesn’t remember Clara — a horrifying fate. There’s no reason to believe this is necessarily the case, but Mark may even be one of those people who surround Franz, after he assaults Clara. After all, both Clara and Franz retain some degree of independence, so it’s possible that Mark would instinctively rush to her aid. Nope, no Mark, nor Pierre. But Mark is seen later, after all. Franz doesn’t recognize him, not only because Franz could barely recall Mark to begin with but because Franz has already become captured by Samaris, which may make his memory even weaker. Mark is the two-dimensional trompe-d’oeil, seen just before Franz discovers the sleepers in their crates. 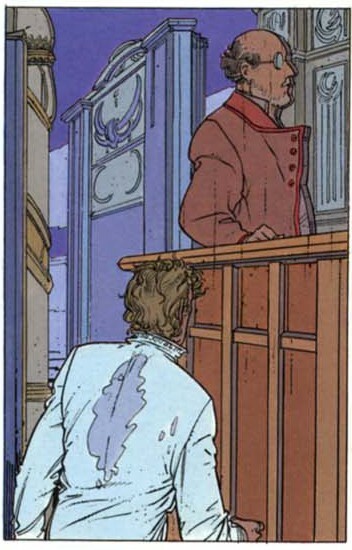 Mark’s coat isn’t exactly the same as in his flashback panel, but its outline is similar. He looks a little older, his hair a little grayer, but it looks remarkably like Mark. They’re even both shown in a similar profile view. If this is true, why has Mark become a flat trompe-d’oeil, unlike Clara? We can only assume that he had less spirit than she or Franz did and that Samaris thus affected them differently. Perhaps Mark has less wanderlust than Clara and accompanied her only at her request. Perhaps, given enough time in Samaris, Franz and Clara would become two-dimensional as well. But this does explain why Clara sits all alone, without Mark, and thus why she’s available to spend time with Clara. It might also explain Clara’s melancholy, as well as why she can’t leave. What happened to the page Franz ripped from the book he finds in Samaris, just prior to his departure? It seems as if it’s going to be a plot point, although we never see it again. In fact, we do see it. It’s on the book’s title page. Now, an image on the title page, which isn’t part of the narrative proper, isn’t necessary part of the story’s continuity. It could just as well be intended as an evocative image, used to transition readers into the feeling of the story to come. But it’s certainly revealing. The page in question, obviously taken from the book Franz finds, depicts the area around Samaris. The accompanying, partially obscured text discusses this same subject. It begins, “Around Samaris are eight large cities,” and it then enumerates them, beginning with Urbanicande (site of the next book in the series). The swirls around Samaris echo the sundew pattern. In the pages of the book that we see in the story proper, an “S” forms at the bottom of the sundew, suggesting Samaris. Both images seem to reflect the idea that Samaris exerts some effect on the surrounding area. So why does Franz leave this page in the desert? Presumably, he took it with him to Xhystos, meaning that it was on his person in the council building. We do not see him discard it en route, and he would have wanted to show it to the council, as evidence of the threat Samaris poses. Why he doesn’t think of it, when trying to prove his story, isn’t clear. Perhaps he lost it, between panels, on the way back to Xhystos. But perhaps he discarded it on the way back to Samaris. That would mean that this single panel, on the title page, is chronologically the final panel of the story. Read this way, it helps to illuminate Franz’s fear for Xhystos, but it also underlines his dejected state. To have discarded such a page represents his final rejection on Xhystos because it was this page that, symbolically or actually, spurred his fears for what he thought was his home town. It represents Franz’s final surrender. But the image is also painful because it represents something beautiful and mysterious, abandoned to be buried in desert sands, presumably never again to be seen by human eyes. It represents a vital piece of information that has been lost, a clue to the mysterious city of Samaris that will never be found again, much less understood. It represents not only Franz’s surrender but the secrets of Samaris. They are secrets into which readers have been given a glimpse, however fleeting and incomplete. But readers should feel lucky, despite the work required to make sense of the clues. Because, as this image of a page lost in the desert sand suggests, the inhabitants of this world are unlikely to get even this much. The secrets of Samaris, the image suggests, are lost to the sands of time. In a book that relies upon twists, only two are obvious: that Samaris is a trompe-d’oeil and that Xhystos is one, when Franz returns to it. Only upon reflection do we realize that Xhystos has been a simulacrum all along. Or that Franz has fallen prey to Samaris without knowing it, which accounts for his missing time. Or that this was the intent of his being sent in the first place. For all the shocking twists that it reveals, The Walls of Samaris withholds others. It rewards thinking, revealing additional shocking twists only upon reflection. There’s no doubt that this is a supremely evocative and intellectual book. In a very real way, we are made to investigate Samaris (and Xhystos), much like the main character. We too are caught in the allure of Samaris, and it’s easy to get so lost in its mysteries that we too feel captured, unable to piece everything together. But the realizations we do come to add additional layers to the text, enriching what was already there. We’ve already seen this, again and again: overlooked clues are found in previous panels (even on the title page), and language that we thought meant one thing carried hidden, subtler meanings. What Franz takes from his strange equivocation of Xhystos and Samaris here is personal, that he’s ready to leave. It adds information to his character, suggesting that he’s got an element of wanderlust that had caused him to agree to the mission in the first place. His buried romanticism, which we’ll see (violently) emerge with Clara, is also suggested visually, not least by that moon, partially obscured by clouds that are invisible at night. Upon reflection, however, we’re able to see this moment, which at first seemed relevant to Franz’s character, as suggesting much more. The scene’s mood, as well as Franz’s underlying romanticism, suggests the attraction of Samaris, which may be an actual force, as suggested by that page Franz leaves in the sand. But when Franz says, “I watched Xhystos again, but it was already Samaris I thought I was perceiving,” he’s saying far more than he knows. After all, Xhystos is something of a trompe-d’oeil, like Samaris, and is already so, when Franz looks at it here. And because Xhystos likely created Samaris, in a very real way, Franz is looking at Samaris. If Samaris represents the alluring falsehood, Franz is also seeing that in Xhystos. He’s romantic about his city, gazing at it once again, as he seems to have done many times. But he’s ready to leave, the falseness of Xhystos having been recently hammered home to him, especially through Anna’s willingness to write him off. The composition of the panel even suggests this alluring falsehood that links the two cities. The portal is almost round, like the moon that sits symmetrically in the sky, suggesting a kind of artificial geometric perfection that’s echoed in the city below. The art nouveau lines around the portal even suggest the sundew pattern. And the way Franz gazes, enraptured by all this melancholy beauty, suggests the way one gazes at a trompe-d’oeil, entranced despite its falsehood. Art is, in many ways, about creating such alluring falsehoods as the scene in which Franz enjoys here — a scene he is, for the reader, a part of. Because of this, it’s perhaps the perfect emblem of the book. It’s beautiful. It’s rich. And it’s full of secrets which can only be appreciated after reading and re-reading, thoughtfully. The Walls of Samaris is not a perfect book. It’s far too ambiguous, and that’s partially a product of its concision. Yes, that ambiguity is rich, and the reader is able to piece together most of the book’s mysteries, but only through considerable, sometimes frustrating work. It would be nice if the story had a little more room, and these added scenes and panels might preserve the intended mysteries and ambiguities, while preventing the reader from wondering about possibilities that only result from seeing something for only a panel, for example. Despite this, The Walls of Samaris remains a masterpiece. It can be enjoyed for its obvious twists, including the brilliant idea of a city that is a trompe-d’oeil, as well as for Franz’s melancholy, romantic character. But it also rewards the reader who parses its small number of pages over and over, examining both the art and the language not only for clues to the text’s many mysteries but also for resonances that might not be immediately apparent. Virtually no other comic book ever created is so dense, so rich in its mysteries. But The Walls of Samaris is no mere intellectual exercise. It’s dense and intellectual, but it’s got an emotional, even romantic core — a core that’s also dangerous, in the tradition of Romanticism. The mysteries here aren’t Nabokovian puzzles to be solved abstractly. They’re wonderous, conspiratorial, and sad. And they’re hypnotic, like Samaris itself. My solutions to the text’s many mysteries need not be your solutions. I don’t know if Peeters and Schuiten would agree with them. Ultimately, it doesn’t matter if they do or not. They’re rooted in the text itself, and sometimes stories invite or even require interpretations and explanations that their creators did not intend. The Walls of Samaris invites you to reach your own conclusions, through hard and careful thinking. I do as well, whether your solutions agree with my own or not. We’ll wrap up next time with an examination of textual variants, including differences between the first and second edition, as well as the existing English translation.